Utah; Utah State Guide; American Guide Series; New Deal; Works Progress Administration; WPA; Federal Writers’ Project; FWP; Federal Project One; Tourism; Great Depression; Pack-Mule Post; Transcontinental Railroad; Promontory Point; Golden Spike. Images of Promontory Point and a pack-mule for the postal service from “Utah: A Guide to the State”, the Utah State guidebook from the American Guide Series created by the Utah Federal Writers’ Project during the New Deal. Utah State University, Merrill-Cazier Library, Special Collections & Archives, Book Collection 39 no. 44. Page 447. This celebration marked the completion of the first transcontinental railroad. This means of mail delivery was in use until 1935. 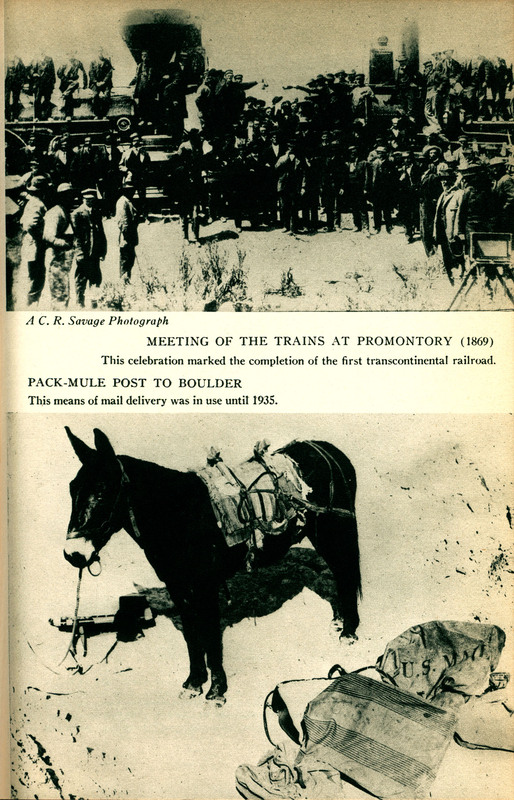 The Utah Federal Writers’ Project, “Utah State Guide Images of the Meeting of the Trains at Promontory (1869) and a Pack-Mule Post to Boulder,” USU Digital Exhibits, accessed April 20, 2019, http://exhibits.lib.usu.edu/items/show/18792.